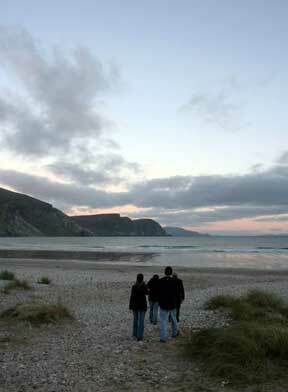 Achill is a large island off the west coast of Mayo and is joined to the mainland by a bridge, making it as accessible as you’re going to get in these parts. It is renowned for its beaches and water sports enthusiasts flock there for surfing, kayaking, windsurfing and all the rest of it. 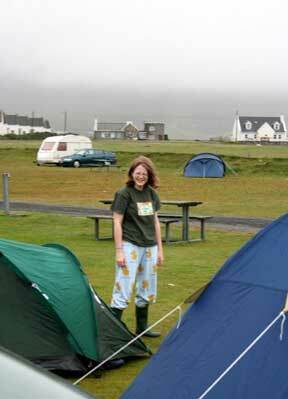 We camped at Keel beach – there is an excellent camp site there. Unfortunately, it’s not close to anywhere and it took us almost three hours to get there from Galway. Friday was a cracking day but by the time we got to Keel, it had already started to mist over. Alb and I got the tent up before it got heavier. By the time Kev and Siobhán arrived from Dublin, it was even wetter. They got their tent up and some things unpacked and we vamoosed for some food… and later, some drink in a terrifyingly nationalist pub (“26 + 6 = 1″, pictures of Gerry Adams and hunger strike martyrs of the H-block, signposts to “United Ireland – 32″). In the morning, the weather was much the same. Then it got worse. We all huddled under Kev and Siobhán’s canopy and devoured eggs and sausages. Donny and Ciara arrived and we watched them pitch their tent in the rain. Can you sense the joy? Camping in the rain is no fun. But… after a few hours, it cleared up and we had an omen of better things to come. Donny and Ciara went diving and after they came back, it was burgers out for a barbeque. By the time we’d finished up, the evening had turned out gloriously. Sunday was just as good but everybody had to head home. Donny and Ciara headed off early. 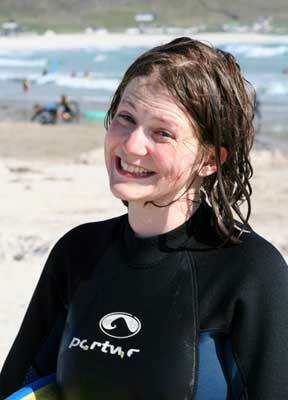 Kev and Siobhán stuck around and I went for a surfing lesson. I’ve always wanted to give it a go but didn’t want to have to invest in a board or a wetsuit first. So I rented them off a guy at the beach and got a lesson from one of the lifeguards. It was so much fun! Also. You know the guys you see on tv and in magazines? They are superheroes. It is the hardest thing I have ever done. I didn’t even get close to standing up on my board. My arms were just too puny. What I like about it is that you’re never in too deep – only as far as waist depth – and when you get it right, there’s a great kick out of it. I got a real surfer glow from the sun and I’m still recovering the power in my arms. I had to use both hands to turn on the light yesterday. We’re off to Electric Picnic on Friday until Monday and then to Boston next Tuesday, so this blog will become more of a travel-log for the next week or two. There’ll still be knitting though, especially with the flight and the bus ride from Boston to New York. Yay! I think I might get a surf board bag because it’s cheaper than a board… and fill it with wool. 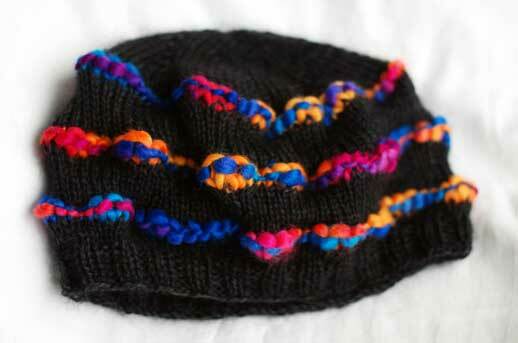 While I was mulling about what sweater to make next, I felt the pull of the hat. I didn’t know which hat, but it was definitely a hat. So I got some Kid Classic and some Colinette, and this is what I ended up with. Lo! And it was funky! Since I’m going away camping this weekend and the next (Electric Picnic! ), a hat like this is a necessity. I called it Jamboree because that was the name of the Colinette colourway, and it’s probably the best way to describe EP, too. The weather has started to pick up here so this morning I figured I should get stuck into Rusted Root, a heavy cotton t-shirt. I got out my cotton, some run-of-the-mill Tivoli blue stuff, and my needles, and went to swatch for it. Ooh, better check the pattern first. Hmmm… where’s the pattern? Maybe it’s on my computer… in Dublin. Sigh. Ok, what else can I start? 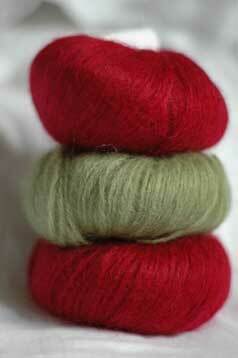 I have the yummy ggh mohair that I got a while ago. I sat and thought for a while. Cardigans are a very attractive design to me because of Irish weather. Jumpers just aren’t as versatile. But I’m a bit tired of doing the whole top-down raglan thing. How about a set in sleeve? Seamless and from the top? If you look really, really closely you will see the seamless set in sleeve (note: some imagination may be required). I’m going to follow Barbara Walker’s instructions but I’m going to knit in the button band as I go along. I have had enough of picking up stitches. It’s just wrong. Evil and wrong. By rights, this should have been finished last May, but here it is in all its glory! 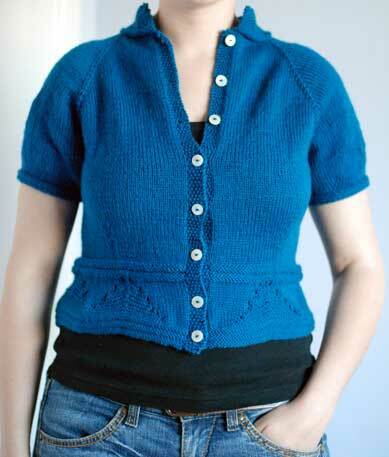 Pattern: Puff-Sleeved Cardigan from ‘Fitted Knits’. Modifications: I had such an incredible problem with gauge that I ended up knitting the 36″ size with a higher gauge. I think the pattern calls for 22 sts over 4″, and I got 24 sts. By doing this, I managed by a stroke of luck to come out at the 35″ size that I wanted all along. From knitting it before I realised that the peplum was going to stick out all over the place, so this time I left out the last two sets of increases in the peplum pattern and dropped down to a 3.5mm needle from that point up to the finish. I used the 4mm needle to cast off to keep it loose enough. I modified the sleeves slightly by knitting them in the round. I added in an extra set of decreases to take care of the seam allowance and I changed to 3mm needles to work the decrease shaping. In retrospect I’m not really sure why I did this but it didn’t seem to hurt! I learned a new cast off for the sleeves – the sewn cast off a la Elizabeth Zimmermann. Not the most attractive cast off, but very stretchy and effective. 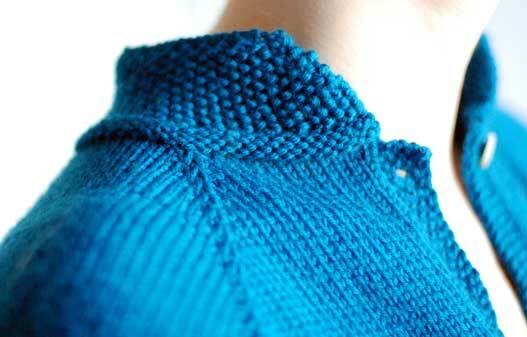 The seed stitch button bands and collar are effective little details. I’m glad to get this cardigan off my needles and into my wardrobe. What’s up next? I have a choice between this, this or a raspberry sweater of my own design. I am torn between the functionality of the tshirt, the gorgeous Rialto I have to knit the second one and the sumptuous colours of the mohair I have for the raspberry jumper. Arrrgh! This is a new philosophy of mine. When you’re waiting for something to come along so you can be done with it – in my case, a concert – time flies about as well as pigs. Then when you stop watching it, it’s suddenly right on top of you. I’m not sure if my pig analogy stretches to that but you get the idea. I just about lose my wig waiting for concerts. I love the preparation and the rehearsals and all the work that goes into getting better. I love dressing up and the idea that my playing gives people a brief respite from the tedium of everyday life. And I love the relief that a job well done brings. But the waiting… I am ready to throw myself off a cliff! Anyway. I have knitting to show but I’m too silly to show it right now. I finished the body of the Puff Sleeved Cardigan and I am amazed to report that my tactic of knitting a bigger size on a smaller needle worked out. I did a few naughty things to make the peplum lie flat but it worked really well. I also finished one sleeve and bought the cutest little tortoise-shell buttons to finish it off. All that needs to be done is the other sleeve and the button bands. Alb did his back in by putting orange juice back in the fridge. The prices we pay for cold juice, eh? So he won’t be along to the concert tonight. Don’t worry – we’re supposed to be camping with friends in Achill (island off the north west of Mayo) next weekend and I would prefer Alb were fit to come camping than to overdo it to make it to the concert. Oh my God, I’ll never make it out alive. This evening, myself and himself ran the Streets of Galway. 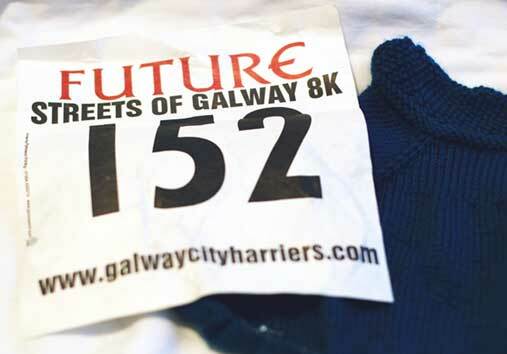 It is an 8k (5 mile) run that goes through the city and finishes up with a run down the Prom at Salthill to the finish line. I ran it two years ago in an hour and five minutes. I was chuffed to have even finished it because I’d never run or trained for anything before. This year, I ran it in 51 minutes and though I found it tough enough after some cushy training in the gym, it’s still 15 minutes better than before. 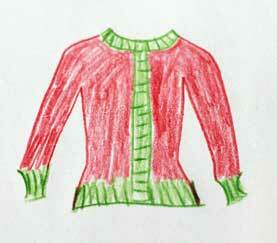 The knitting of the Puff-Sleeved Cardigan has been a confusing one. I am knitting a larger size than I need to but at a slightly smaller gauge. It seems to be working out but I am very wary of the whole thing. I keep feeling like it’s about to blow up in my hands. 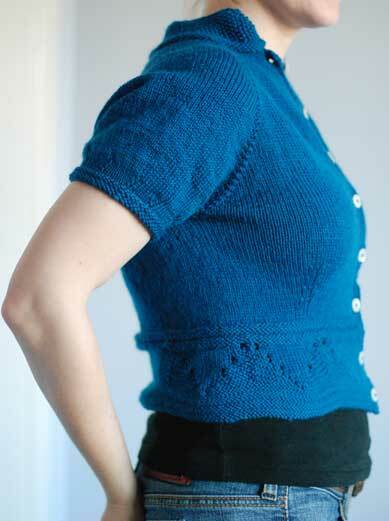 All going to plan, I’ll be separating off the sleeves tomorrow and then it’s hell-for-wool to the finish line!